Okay, let me just preface this by saying that if feet freak you out, this post is not for you. Pedicures. We all need 'em. Some of us get 'em. Others of us give them to ourselves. Many of us do both! 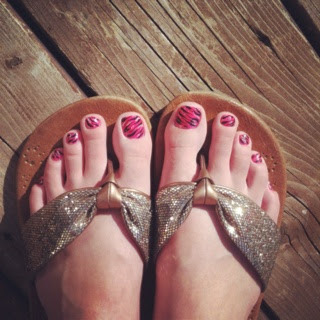 :-) I definitely am not creative with my toesies. The wildest thing I do is get those (a-freaking-mazing) Sally Hansen nail stickies and put those on my nails. 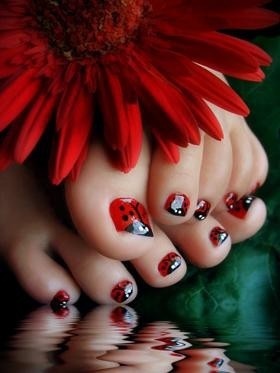 It looks very cute, and I would recommend them to anyone, but how awesome is it when people make their toes into art?! What's your go-to nail polish color for your toesies in the summertime? Aww, the flag design is a cute idea for July 4th! I always like putting really "loud" colors on my toes... colors I don't really wanna put on my nails. I'd say that my favorite color would be anything with sparkles. Hahah. Love, love, love the polka-dots! So dainty and feminine. Love, love, love the polka-dots. So dainty and feminine.